"Graham crackers" redirects here. For the 1997 Graham Chapman book, see Graham Crackers. The graham cracker is a sweet, cinnamon-flavored cracker made with graham flour. It originated in the early 1880s, and is a mass-produced product in contemporary times. It is eaten as a snack food, sometimes with honey, and is used as an ingredient in some foods. The name can be pronounced as /ˈɡreɪ.əm/ or /ˈɡræm/ in North America. The main ingredients in its earlier preparations were graham flour, oil, shortening or lard, molasses and salt. Graham crackers have been a mass-produced food product in the United States since 1898, with the National Biscuit Company being the first to mass-produce it at that time. The Loose-Wiles Biscuit Company also began mass-producing the product beginning sometime in the early 1910s. The product continues to be mass-produced in the U.S. today. 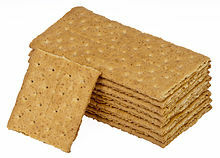 In earlier times, mass-produced graham crackers were typically prepared using yeast-leavened dough, which added flavor to the food via the process of fermentation, whereas contemporary mass-production of the product typically omits this process. The dough is sometimes chilled before being rolled out, which prevents blistering and breakage from occurring when the product is baked. Graham cracker crumbs are used to create graham cracker crusts for pies and moon pie, and as a base, layer or topping for cheesecake. Graham cracker pie crusts are also mass-produced in the United States, and consumer versions of the product typically consist of a graham cracker crumb mixture pressed into an aluminum pie pan. The graham cracker is a main ingredient in the preparation of the s'more. ^ "Homemade Graham Crackers". Retrieved March 21, 2019. ^ a b c Krapp, Kristine (1997). How Products are Made. Gale. pp. 181–182. Retrieved September 12, 2018. Over time, it became known the graham cracker. Due to its popularity and innovation, other bakeries copied his recipe and eventually developed methods for its mass production. Since then, graham crackers have been a popular snack food. They have also become an important ingredient in pie crust recipes. ^ a b Iacobbo, Karen; Iacobbo, Michael (2004). Vegetarian America : a history. Westport, Conn.: Praeger. ISBN 978-0-275-97519-7. ^ Smith, Andrew F. (2009). Eating history : 30 turning points in the making of American cuisine. New York: Columbia University Press. ISBN 978-0-231-14092-8. ^ a b Tompkins, K. W. (2009). "Sylvester Graham's Imperial Dietetics". Gastronomica. 9: 50–60. doi:10.1525/gfc.2009.9.1.50. JSTOR 10.1525/gfc.2009.9.1.50. ^ Gill, J.T. (1881). The Complete Bread, Cake and Cracker Baker. The Complete Bread, Cake and Cracker Baker. J. Thompson Gill, manager Confectioner and Baker Publishing Company. p. 98. Retrieved September 12, 2018. ^ Smith, A.F. (2013). Food and Drink in American History: A "Full Course" Encyclopedia [3 Volumes]: A "Full Course" Encyclopedia. EBSCO ebook academic collection. ABC-CLIO. p. 409. ISBN 978-1-61069-233-5. Retrieved September 12, 2018. ^ Armstrong, D.; Armstrong, E.M. (1991). The Great American Medicine Show: Being an Illustrated History of Hucksters, Healers, Health Evangelists, and Heroes from Plymouth Rock to the Present. Prentice Hall. p. 59. ISBN 978-0-13-364027-4. Retrieved September 12, 2018. ^ Report of the State Entomologist of Connecticut for the Year ... Bulletin (Connecticut Agricultural Experiment Station). 1915. p. 230. Retrieved September 12, 2018. ^ Matz, S.A. (1992). Cookie and cracker technology. AVI book. Van Nostrand Reinhold. pp. 124–125. ISBN 978-0-442-30892-6. Retrieved September 12, 2018. ^ a b The Cracker Baker. American Trade Publishing Company. 1920. p. 6-PA42. Retrieved September 12, 2018. ^ Cole, Edith Walters (1967). "Sylvester P. Graham, "father of the Graham Cracker"". The Southern Speech Journal. Informa UK Limited. 32 (3): 206–214. doi:10.1080/10417946709371875. ISSN 0038-4585. ^ Chilton's Food Engineering. Chilton Company. 1998. p. 69. Retrieved September 12, 2018. ^ Haedrich, K. (2011). Pie: 300 Tried-and-True Recipes for Delicious Homemade Pie. Non Series. Harvard Common Press. p. 51. ISBN 978-1-55832-254-7. Retrieved September 12, 2018. ^ Y.-Y. HAO, A. J. SCOUTEN, and R. E. BRACKETT (1999) Cheesecake: A Potential Vehicle for Salmonellosis?. Journal of Food Protection: January 1999, Vol. 62, No. 1, pp. 26-29. ^ "Recipe: New York-Style Cheesecake". The Mercury News. March 26, 2018. Retrieved September 12, 2018. ^ Davis, A.; Kirk, C.P. ; Wells, C. (2010). The Kansas City Barbeque Society Cookbook: 25th Anniversary Edition. Andrews McMeel Publishing. p. 258. ISBN 978-0-7407-9010-2. Retrieved September 12, 2018. ^ Savoie, Lauren (April 10, 2017). "Tasting Ready-Made Graham Cracker Crusts". Cook's Illustrated. Retrieved September 12, 2018. ^ Harrington, Robert J. (2005). "The Wine and Food Pairing Process". Journal of Culinary Science & Technology. Informa UK Limited. 4 (1): 101–112. doi:10.1300/j385v04n01_11. ISSN 1542-8052. ^ Miller, Jeffrey (July 25, 2018). 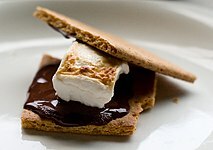 "S'mores: How this American campfire snack came from the Industrial Revolution". The Independent. Retrieved September 12, 2018. "Almanac: Graham crackers". CBS News. July 5, 2015. Retrieved September 12, 2018. The Origin of Graham Crackers. Snopes.com. 7 Things You Probably Didn’t Know About Graham Crackers. Food Republic. This page was last edited on 8 April 2019, at 23:30 (UTC).